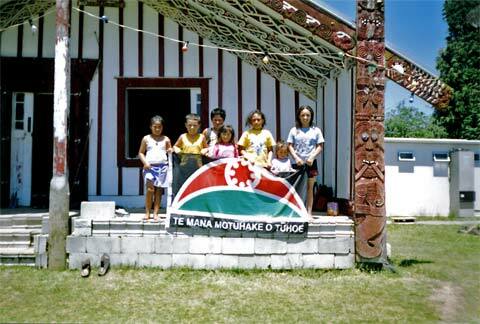 These children were photographed in front of Tāne-nui-a-Rangi meeting house, Maungapōhatu, on New Year’s Day 2004. Many Tūhoe people return to the small scattered communities in the Urewera at special times such as Christmas. This is an opportunity for them to renew relationships with the kin at home who keep the fires burning. It is also a time to pass on to the next generation the special character of the Urewera region. In January 2004 over 100 descendants of the chief Rakuraku trekked from Waimana south to Maungapōhatu over three days. They wanted to show the younger people the various places where Rakuraku stayed.